Tel Aviv designer Nir Meiri used seaweed to create the shades of these lamps. Nir Meiri made the lamps by draping fresh seaweed over a structure of thin metal spokes attached to a metal base. The final shape of each lampshade is formed as the seaweed dries and shrinks, before being set with a preservative. 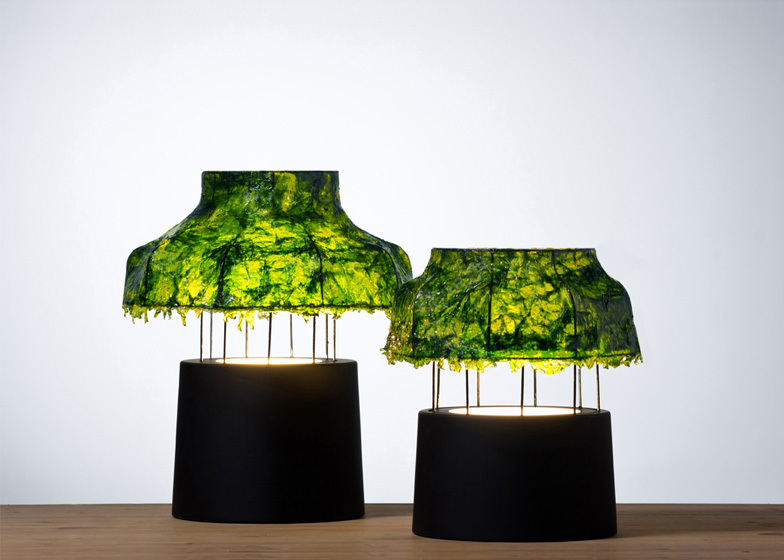 This isn't the first time a lamp has been crafted from seaweed. London-based designer Julia Lohmann previously used dried strips of seaweed to make laser-cut kelp lampshades. Other lamps we've featured by Nir Meiri include a set of table lamps with metal shades hanging from thin stalks and a collection of tactile moulded lights made from desert sand. Photography is by Shay Ben Efrayim and Aviram Ohad. This project is inspired by the sea. Through the unconventional use of seaweed as a main material for a domestic environment, the product plays on the tension between the artistic and the commercial. Ancient cultures have appreciated and utilized seaweeds for different uses. Today, seaweeds are cultivated and harvested on a commercial scale, as a result of a growing interest driven by environmental concerns. The Marine Light lamp combines a metal base and a structure of thin metal strings for the lamp-shade. The seaweeds are applied on the metal strings while still fresh. As they dry, they shrink and obtain the form of the lamp-shade. A mixture of preserving material is applied to preserve them. The light reflected through the seaweeds and the morphology of the lamp induce underwater images Furthermore, the use of seaweeds, borrowed from other disciplines into the world of design, might inspire new thinking in the field.